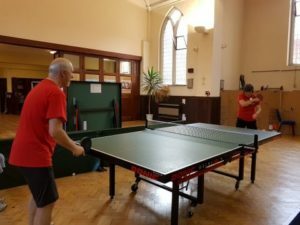 I’ve played table tennis since childhood, including in local leagues in Durham, Reigate, Stockton and Oxford, and for Oxfordshire County Veterans. I do talks on the lighter side of table tennis, have written a “table tennis novel”, am a licenced table tennis coach, and married my university table tennis doubles partner. So the sport has always been part of my life. In 2014, I became Development Officer for Oxford & District Table Tennis Association. I took on this new, voluntary role to develop more social table tennis opportunities in Oxford, and it’s become almost a full-time occupation. I started with a trial run of drop-in sessions at Temple Cowley United Reformed Church, and these have continued ever since. Our Thursday morning over-55s session has proved especially popular. I work a lot with other organisations and individuals, both local and national, making connections and promoting the social and health benefits of table tennis. These include Table Tennis England, Age UK Oxfordshire and the council’s Go Active and Ping! Oxford programmes. With others, I formed Oxford Community Table Tennis Club in January 2019. It’s a new, inclusive Premier table tennis club which will run the social sessions and have competitive league teams as well.